Increasingly we find video monitors in offices and stores that play looping slideshows. All too often these things must either be started by the first people to arrive at work in the morning (and stopped by the last person leaving) or, worse, are left running 24 hours a day. With Automator you can make presentations automatically switch on and off at exactly the times you specify. Here’s how. To begin, create a presentation in Apple’s Keynote that includes all the slides you desire. Within Keynote choose View > Show Inspector and click the Document tab (the first one) in the resulting Inspector window. Enable the Loop slideshow option and from the Presentation pop-up menu choose Self-playing. Configure the Transitions and Builds fields so that each slide plays for the length you want before moving to the next one. Save the presentation and quit Keynote. 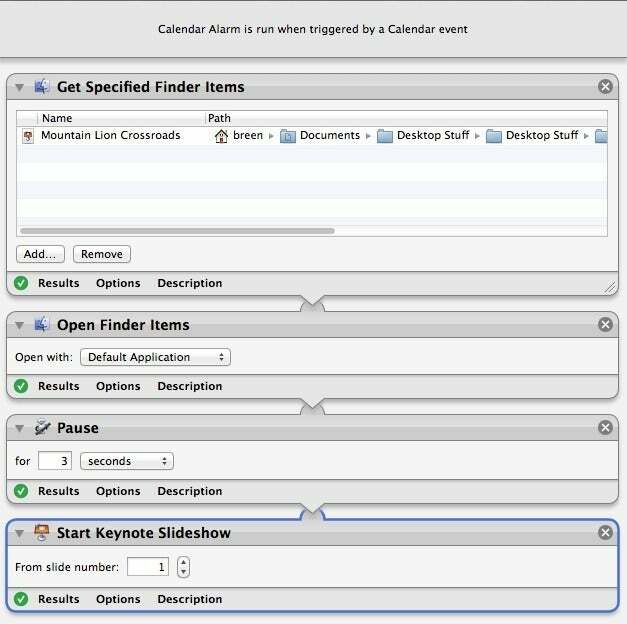 Launch Automator (in your Applications folder) and from the workflow chooser that appears, select Calendar Alarm and click Choose. Select the Files & Folders library and from within that library drag the Get Specified Finder Items and Open Finder Items actions into the workflow area. Next, select the Utilities library and drag the Pause action into the workflow. Finally, select the Presentations library and add Start Keynote Slideshow to the workflow. In the Finder locate your Keynote presentation and drag it into the first action (Get Specified Finder Items). The second action’s pop-up menu should read Open With Default Application. Configure the Pause action to pause for 5 seconds. And the final action—Start Keynote Slideshow—should start from slide number 1. Save the workflow and you’ll be prompted for a name. Enter that name and click Save. The Mac’s Calendar (or iCal) application will open and add an event to the current day. Configuring the workflow's schedule in Calendar. To create a schedule for your slideshow, select that event, press Command-E to bring up the editing window, and configure the event so that it repeats on those days you wish the slideshow to play. (For weekdays choose Custom, select Weekly from the Frequency pop-up menu, enable buttons representing Monday through Friday, and click OK. In the from area choose a time for your presentation to play—9 AM, for example. Click Done and your presentation will fire up each weekday at 9 AM. And what to do about stopping the kiosk at the end of the day? Create another Calendar workflow with this single action, pulled from the Presentations library: Stop Keynote Slideshow. Save this workflow and you’ll create another calendar event. Configure this one so that it triggers each weekday at quitting time—5 PM, for instance. To be even more energy efficient, launch System Preferences (Apple menu > System Preferences), choose the Energy Saver preference, click the Schedule button in the resulting window, and configure the Start up or Wake and Sleep or Shut Down settings so that your Mac isn’t working during your off-hours.